“Most legacy systems built before 2011 have a traditional PC BIOS. This type of BIOS uses a Master Boot Record (MBR). The MBR Partitions can define a disk drive capacity up to 2.2TB. Windows operating systems that boot from an MBR are therefore limited to 2.2TB per MBR. A 3TB disk drive in a legacy BIOS and Window system will need a DiscWizard device driver to access the full capacity of a 3TB disk drive. Two partitions will be necessary because of the MBR limitation. The device driver mounts the capacity above 2.2TB with another MBR which looks to the system as a second virtual “physical” device. 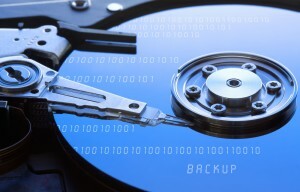 PCWorld: The problem with deploying 3TB drives relates to older PCs (those more than a few months old, in most cases), and stems from the formula 2^32*512=2,199,023,255,552, or 2.2TB – a hard-drive addressing scheme found in legacy BIOSs and operating systems. In that formula, 2 indicates binary, 32 is the number of bits allowed in a legacy disk address, and 512 is the number of bytes in a legacy hard-drive data block. If the BIOS, drivers, I/O card, or operating system in your PC still plays by rules that involve this formula, you’ll have issues installing and using a 3TB drive. This situation could have been avoided if the entire computer industry had future-proofed after enduring the 137GB (28-bit) limit problems that cropped up around the turn of the millennium. In truth, most vendors did, with the notable exception of Microsoft. The company chose not to implement support for anything larger than 2.2TB drives in any of its 32-bit consumer operating systems – including Windows 7. Installing a 3TB Drive: Note that NTFS is limited to 2^32 clusters, also known as groups of sectors. That means you must format the drive with at least 1024-byte clusters, or you’ll fall prey to the formula I talked about earlier. The default is 4096, which allows up to 16TB; however, converting FAT partitions to NTFS often results in 512-byte clusters. If you’re trying to move a FAT partition to your new drive–don’t. You’re better off creating a new partition, reinstalling the OS, and restoring the files you backed up (it’s always wise to back up before doing any partitioning operations). This is because the FAT partition will in all likelihood be misaligned with the Advanced Format of your new drive. Tip: With drivers or programs that don’t allow a full 3TB partition, you can use Windows dynamic volumes to combine two partitions into a single drive letter. Windows Vista and Windows 7 introduced a new partition-table scheme, dubbed GPT (for GUID Partition Table). The GPT blasted past the previous limitations by supporting up to 8 zettabytes. (2^64 sectors, which, when using 512 bytes per sector, equates to 8 zettabytes). For perspective, consider that 1024 terabytes equal 1 petabyte, 1024 petabytes equal 1 exabyte, and 1024 exabytes equal 1 zettabyte. Though not strictly a 3TB issue, all of the shipping 3TB hard drives also use Advanced Format, a low-level storage scheme employed on newer drives. AF uses larger 4KB data sectors, an approach that improves performance and diminishes the number of addresses required for any given amount of data. If you transfer legacy partitions via image backups to an AF drive, or if you format an AF drive with XP, the older 512-byte sectors might not align correctly with the new scheme. UEFI BIOS desktop systems are new since 2011. Windows 7 64-bit and Vista 64-bit operating systems support booting from UEFI and GPT without the need of a non-Microsoft device driver. This is the Windows native solution for booting a 3TB drive to a single partition. Windows 7 and Vista support GPT 3TB single partitions. Windows 7 and Vista can only boot GPT on systems with UEFI BIOS. Windows 7 and Vista can mount a GPT non-booting data drive. Intel RST device drivers before v10.1 do not support 3TB disk drives. Windows systems with Legacy BIOS and MBR boot drives are limited to 2.2TB partitions. Windows XP x32 does not support GPT. Windows XP x64 edition can use GPT disks for data only. Only Windows XP for Itanium-based systems can boot from GPT partitions. While 32-bit Windows XP systems can’t handle GPT natively, there is a solution: Paragon Software Group’s Paragon GPT Loader, that allows you to to utilize all 3TB in a single data partition. DiscWizard software (Acronis®) can install a device driver which opens the full capacity of a 3TB. You can use it to create a second partition for the capacity above 2.2TB. DiscWizard v13 with support for 3TB drives is now available. For a Flash tutorial: Cloning your old drive to a 3TB using DiscWizard. Part 1, Part 2. For a Flash tutorial: Using DiscWizard to access the full capacity of a 3TB after you built a Windows 7 or Vista system. For a Flash tutorial: Using DiscWizard to access the full capacity of a 3TB after you built a Windows XP system. Chatwin’s opinion: The Patriot Inferno (on the left) has excellent random R/W values, thanks to the SandForce controller, which uses complex algorithms to compress small user-data into 4K flash pages. The manufacturer also implements some kind of data redundancy, to ensure data integrity. All of this increases the IOPS and efficiency of the SSD and reduces the need for high quality (SLC) NAND flash or large DRAM buffers. The Indilinx controller of the Vertex Turbo (on the right) has a straight forward page level mapping (with 64 MB memory cache to combine write requests). In combination with a logical/physical 1:1 mapping (LBA/SSD), the Vertex (RAID 0, specifications: “The Force“) outperforms every other MLC SSD I’ve seen so far in access time (except the Intel X25-M G2 Postville, with a narrowed write bandwidth of 95 MB/s and 32K clustering on-the-fly, these SSD’s are simply unbeatable…). The sequential read/write speed is quite impressive. 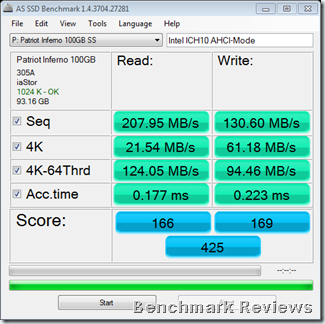 The two OCZ Vertex Turbo’s score lower IOPS values than the Patriot, but the bandwidth is much higher, even for RAID configurations. Besides an exceptional response time, the result is better write coalescing when using my workstation for day-to-day stuff: email checking, editing office documents, internet browsing (caching redirected to hard disk of course). An average of 30 MB/hour at the most (zero to 3 when left for idle). I use Diskeeper HyperFast for maintenance, but so far it never initiated an automatic (free space) defragmentation. Even after several months of installing software and restoring system backups.